« Who will pay for an app to search cheap airfares on Ryan Air? 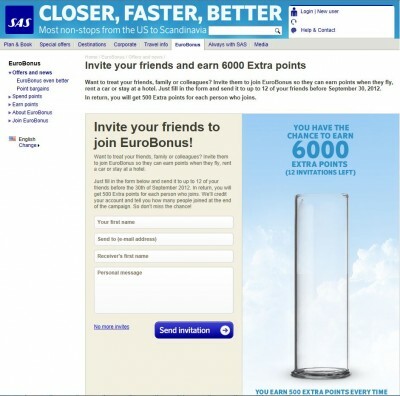 SAS have made a new campaign where you can earn some easy Eurobonus point (up to 6000). All one have to do is find 12 friends, family or colleagues who does not have an account. Then from the below web site send them an invite and each of the 12 invites who do not have an account. Each of them creating an account from the mail will give you 500 points to your account.